Watches are the most important accessory you will wear on your arm during your lifetime! And for women who are mother's, it can especially be difficult to accessorize your arm because duties and children call! 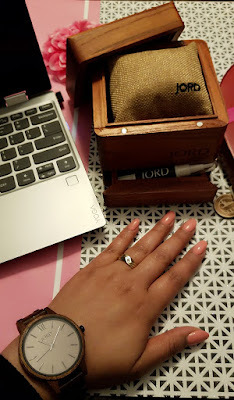 But I can say one thing as a mother of four, student at one time, and part-time worker during another, I love watches that are light as if I am almost not wearing one! So, when Jord watches sent me one of their timeless wooden watches, I had to see for myself how I would like it. To my surprise, I was simply breath taken, not only by the detailed box it was delivered in, but the fit and detail to it. My watch is so light that it feels as if I am not wearing one!